HOUSTON -- Three members of the Expedition 31 crew undocked from the International Space Station and returned safely to Earth Sunday, July 1, wrapping up a mission that lasted six-and-a-half months. 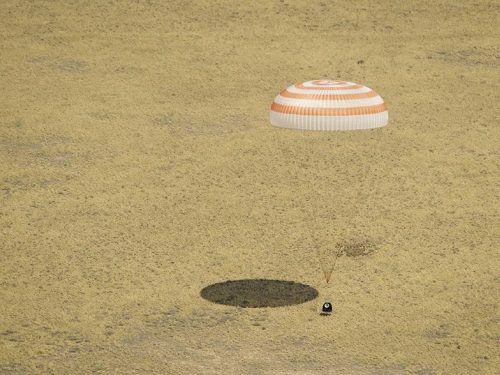 Russian Commander Oleg Kononenko, NASA Flight Engineer Don Pettit and European Space Agency Flight Engineer Andre Kuipers landed their Soyuz TMA-03M spacecraft in Kazakhstan at 3:14 a.m. CDT (2:14 p.m. local time) after undocking from the space station's Rassvet module at 11:47 p.m. June 30. The trio, which arrived at the station Dec. 23, 2011, spent a total of 193 days in space, 191 of which were aboard the station. During their expedition, the crew supported more than 200 scientific investigations involving more than 400 researchers around the world. The studies ranged from integrated investigations of the human cardiovascular and immune systems to fluid, flame and robotic research. Before leaving the station, Kononenko handed over command of Expedition 32 to the Russian Federal Space Agency's Gennady Padalka, who remains aboard the station with NASA astronaut Joe Acaba and Russian cosmonaut Sergei Revin. NASA astronaut Sunita Williams, Russian cosmonaut Yuri Malenchenko and Japan Aerospace Exploration Agency astronaut Akihiko Hoshide will join them July 17. Williams, Malenchenko and Hoshide are scheduled to launch July 14 from the Baikonur Cosmodrome in Kazakhstan. On June 25, Pettit celebrated achieving one cumulative year in space, combining his time in orbit on Expedition 6, Expedition 30/31 and the STS-126 space shuttle Endeavour flight to the station in November 2008. Pettit now has 370 days in space, placing him fourth among U.S. space fliers for the longest time in space. During Expedition 31, Pettit also used household objects aboard the station to perform a variety of unusual physics experiments for the video series "Science Off the Sphere." Through these demonstrations, Pettit showed more than a million Internet viewers how space affects scientific principles.